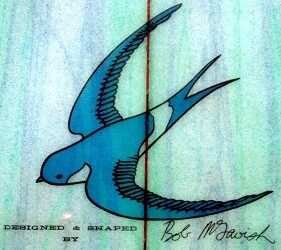 1972 Bluebird by Bob McTavish 7ft 1 1/2"
CONSTRUCTION: Foam blank, 1/16" redwood stringer, tint laminate, spray/paint. Leg rope hole at rear. "Built at first factory in the Byron Bay Industrial Estate, started by Warren (Cornish), J.T. (John Thomas) and myself about 1972. Shaped by myself and glassed by J.T." - Bob McTavish's comments on examining the board at his book launch and signing at the Manly Festival of Surfing 7th November 2009. Purchased 2002 from St George's Basin Cash Convertors. Minor repairs, nose and tail resin blocks and polish. 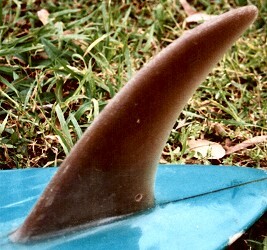 Extreme gun shape for North Coast point breaks. Early use of spray/paint onto foam on the deck. Volume 20 Number 1 January 1979 pages 50 - 51. Full version, originally a two page centre spread, below. 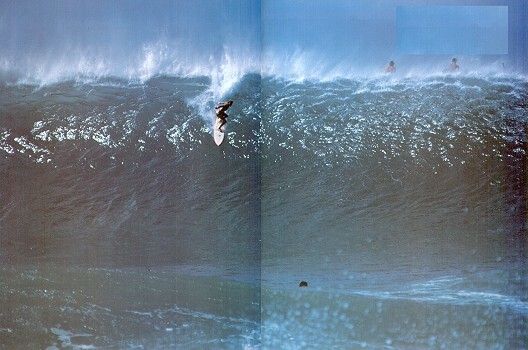 Terry Richardson, Pipeline, experiencing the gut-wrench! Geoff Cater (2004 - 2013) : Catalogue: McTavish Bluebird Pintail, 1972.